Not every course you create is meant to be an island. Some courses are built to be banded together, taken as a group – one after the other to create a holistic experience. This is where Learning Paths come in. Learning Paths are the well-oiled course delivery machine of a learning management system (LMS). Perfect for businesses needing learners to master a complete subject or program, they’re simple to set up and make course enrollments hassle-free. To help you get started, we’ve created a complete walkthrough of Learning Paths. We’re explaining everything: what exactly a Learning Path is, different types, and how you can create a Learning Path of your own. Firstly, what is a Learning Path? A Learning Path is a selection of courses tied together for learners to progress through, mastering a particular subject or program. It allows you to enroll multiple users in multiple courses at once saving you valuable time. It’s an incredibly simple, yet highly-powerful feature you should utilize in your LMS. 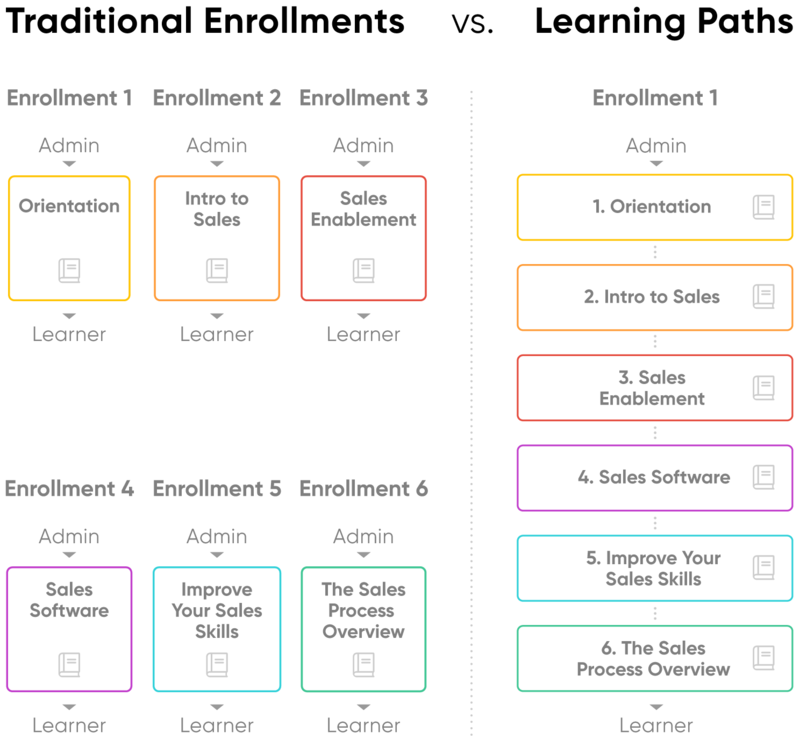 Why use Learning Paths for your business? Learning Paths have stellar benefits for you and your learners, adding a real level of convenience for both of you. Commonly, Learning Paths are used to add structure to training programs. When rolling out training to your learners, they give you the ability to control both the order in which courses get assigned and the timeframe in which the courses become available. From your point of view, as an admin, it’s normal for Learning Paths to be set up well in advance of learners being enrolled to condense administration time. Then, once you set the learner off on the path, they’re largely self-sufficient. Your learner finishes one course, and they’re automatically added to the next – no work needed from you. From the learner’s perspective, a Learning Path ensures that they are working towards an overall goal. It keeps them on track and engaged with your course content. If the course is sequenced they can focus on the goal that they are currently working on without being overwhelmed (the course they’re currently completing is the one on their dashboard). Onboarding new hires usually takes weeks, if not months. Typically, they have to take multiple courses in an LMS before they have completed their employee training. Traditionally, you would have to enroll your learners in each of the courses individually. But with Learning Paths you can skip this tedious step. As courses are grouped together, you only have to enroll your learners once. Then they are automatically enrolled in all the courses, drop-fed each course, one after another, until they cross the finish line, completing their onboarding goal. Even neater is when you integrate your LMS with your HR system. Then, when a new hire joins, they are automatically added to the LMS and then automatically enrolled in the onboarding Learning Path. It’s super efficient for your business. Learning Paths for employees isn’t the only use case; it’s also a top tool for customer and partner education too. You can tie courses together that give detailed guidance on how to use your product or service. You can walk learners through common support queries, upsell, or explain new features… the list goes on. And, similar to to employee training, if you connect to your CRM, learners are added to your LMS and to your Learning Paths automatically. Easy peasy. Not all LMSs are created equally. Learning Paths in each will be slightly different. So today, we’re showing you how LearnUpon LMS’s Learning Paths work so you’ll have an idea of the types available. With Sequenced Learning Paths, the learner is enrolled on a Path that contains a number of courses in a particular order. As the learner completes each course, they’re given access to the next. The admin chooses to allow access to the next course immediately or after a set period of time. In a Sequenced Learning Path, the learner must complete all courses in order to complete the Path. We see businesses use Learning Paths to combine courses from the same subject matter all the time. And if the courses increase in complexity or mastery level, we usually suggest a Sequential Path as the best option. If you need a learner to only progress to the next course if they’ve passed an exam, then you can ensure that a learner only has access to courses at their level of understanding. Learners are enrolled in a Learning Path and have access to the first course titled “Introduction to Sales”. Once completed, they’ll automatically be given access to the next, “Intermediate Sales Enablement”. Once they’ve done the same for the 2nd and 3rd courses, they’ll have successfully completed the Path. As mentioned above, a Sequential Path makes the most sense here because of the escalating level of difficulty. However, Sequential Learning Paths don’t always have to be done by subject matter. They’re ideal for those who want to build structured learning programs for a collection of courses to be done in a particular period of time – like with our new hire onboarding example. This Path would include various courses that a new employee needs to cover. Each course would be rolled out to them in a logical order. E.g. : Orientation – Policies and Procedures – Health and Safety, etc. Alternatively, Learning Paths with Learner Choice are a more flexible choice. In this case, the learner has to complete a certain number of courses available to them. Say, for example, the learner is given 6 courses to choose from, with the completion of 3 being the goal. They pick the 3 they want to do and the order in which they want to take them. FYI, it’s up to you to select how many of the total amounts of courses have to be completed. If you wish, you can set it up so the learner has to complete all the courses, leaving the order of completion as the learner’s only choice. A choice-based Path is a fitting pick when the order isn’t important. This version of a Learning Path gives the learner more power to choose their own Path. Not all courses should or need to be completed in quick succession. That’s why Learning Paths also have controlled timeframes. It enables you to set a timetable for when you want each course to become available to the learner. When you don’t want learners to have immediate access to the next course in a Path, you simply set up rules to dictate the time period that the course is made available to them, regardless of when they were enrolled. Back to our new hire onboarding example: you can set up a course to be completed during the first week of the employee joining. Then you can either choose to allow your new hire to immediately take their second course or you can delay it. You put a rule so that the next course is only available when the first course is passed + 3 days. This allows you to stagger out the selection of courses, it prevents the learner from charging through, and gives them time to process the information you’re providing. Simple to set up and saves you so much time, grouping courses with Learning Paths is one of our favorite ways to organize training programs. It works well with an automated process, and learners appreciate the guidance it gives. And if you pair it with other popular LMS features like Gamification and Certification, it makes your learning management that much easier.